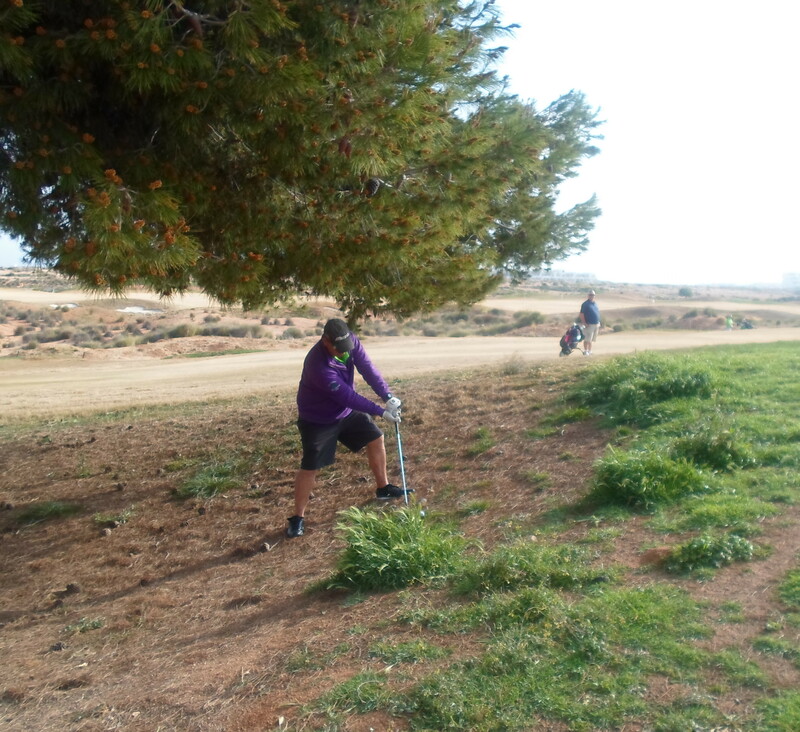 this shows the strength of the wind on hole 8, the pin bending, the flag horizontal……. 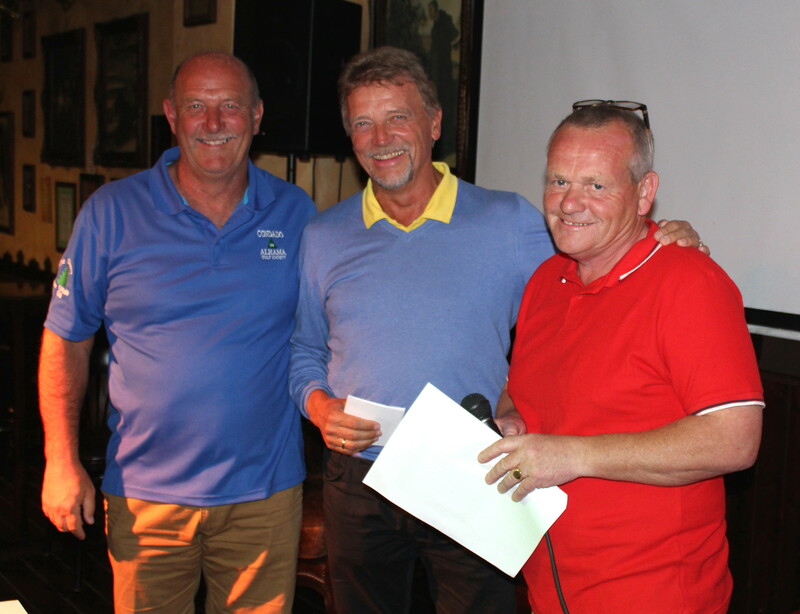 This week was the Dublin crystal stableford, which is played for 4 times a year and is sponsored by Paul Culligan. There were 60 players (a full sheet) so be aware early booking is advised as spaces are limited. Several players were disappointed to arrive this week only to find that they were unable to take part. At the moment the indications are that it will be another full sheet (72 players?) next week for our second major of the year. After a week of dreadful weather (albeit with welcome rain!) we were back to spring-like Spanish sunshine. Lovely temperature (into the high 20’s), but a really strong (but warm!) wind, which made scoring very difficult. But 2 players managed to play below par, leaving 8 more within one shot of each other tussling for the lesser prizes. 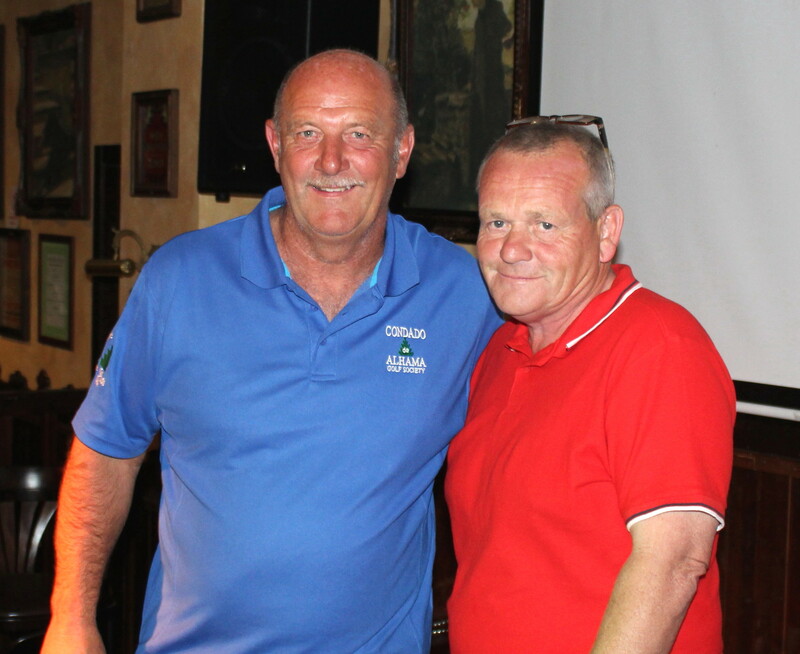 Peter is always good for a 9 hole score, but this week played 18 great holes………..
Chris in the prizes again….. always very consistant………..
Mick was the winner in division 2……….. It was nice to see the lakes on 11 and 13 full to the brim (maybe as a result of the recent rains?). Players who have visited other courses all say that our greens are by far the best around. lake on 13 is full to the top also………..
Next week is the 2nd major of the year, the Graham White pairs strokeplay event. This is drawn out pairs and the draw will be at 7.30pm Wednesday April 1st in the Clover bar. The entry sheet is in the golf shop, but if you need a buggy either put a ‘B’ on the list or email me at the above address. It is drawn, but we try to arrange buggy users in the same 4 ball. Note that there is a link on this page now for bookings and events. Also from April 1st the Monday and Wednesday stablefords at Condado will become qualifiers for handicap purposes, as voted for at the recent AGM. It will not be compulsory to enter the sweep to play in a society time. Also it is time for all members to renew their membership from April 1st. Please note unless you played 4 times or more in qualifying competitions last year (with the society) your handicap will be classed as inactive, so please bring evidence of you current playing handicap to Kevin. Another consequence of the AGM is that membership is open to people living/staying on site and IRM members only. Previous members (not on site) who join again will not be affected by this rule if they renew by April 30th. No jokes this week, but I have decided to return to a feature on our players. This week a face to the name, John Collins. 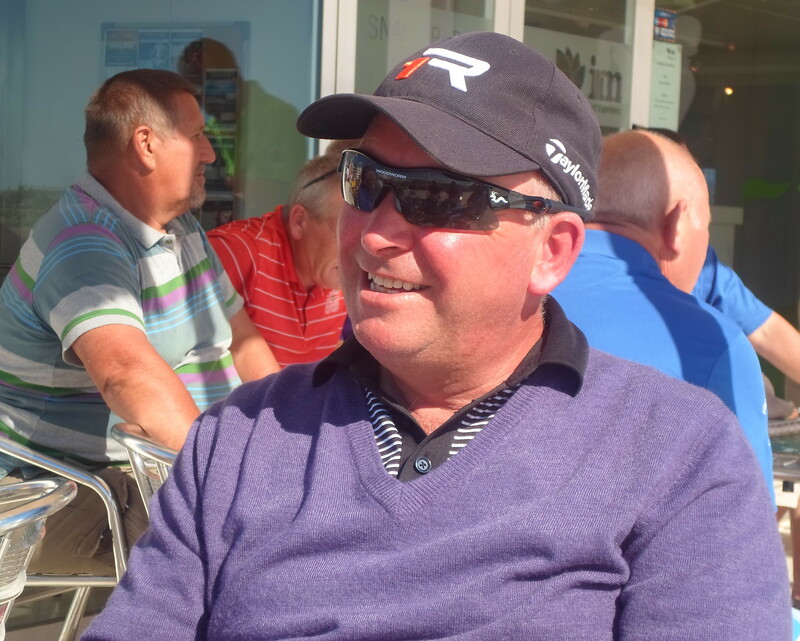 John is from East Kilbride in Scotland and plays off a very respectable 15 handicap, and resides on site for several months each visit. a good view of the eclipse………….. The bad weather forecast didn’t quite materialise, but threatening skies and very strong winds kept the 40 entrants on their toes, ready to head for the bar! Fortunately we were able to get ten teams. Thanks to the cloud cover, we were lucky enough to get a glimpse of the solar eclipse, which would have been impossible with our normally cloudless skies! All the golfers were glad to get back to the warmth of the clubhouse, and discard their waterproofs. Our team were very lucky to be first out, and take advantage of the early mild and windless conditions. Nice to have our captain, Dave, back with us again and in the prizes straight away! I was just a makeweight filling in for Les (big shoes to fill), but now been dumped for next week! red flags are easy to see………. nice to see the lake on hole 5 is being filled……. we had a rather slow 2 ball in front of us……………..
and the crowd gather to look at the result of the putt………. The sheet is now up in the shop for the Graham White pairs major competition on Good Friday, April 3rd. Next week is the Dublin Crystal individual stableford. 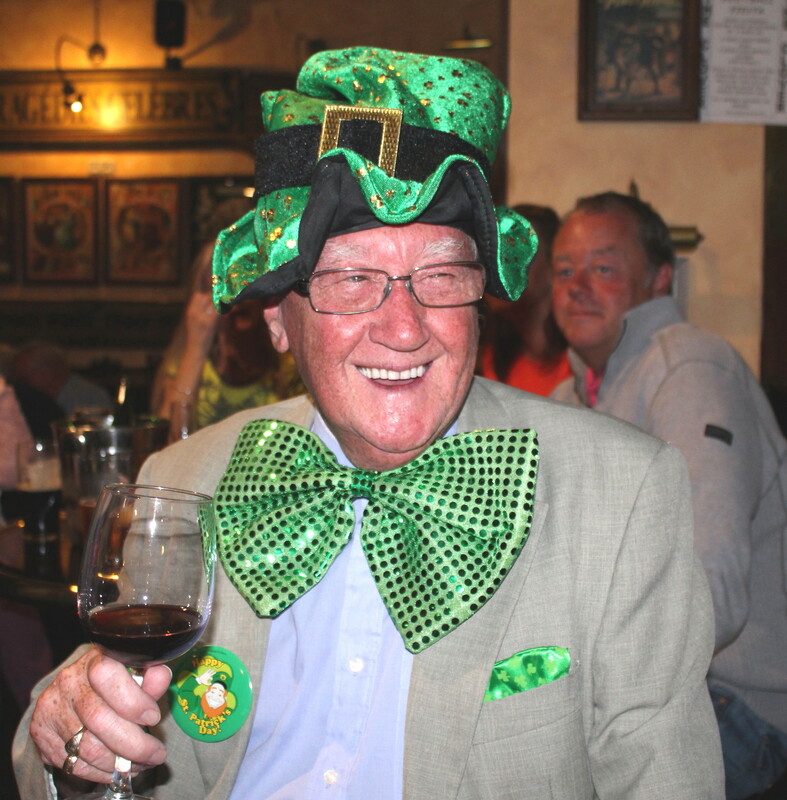 Before you read the rest, click on the link for an Irish greeting! 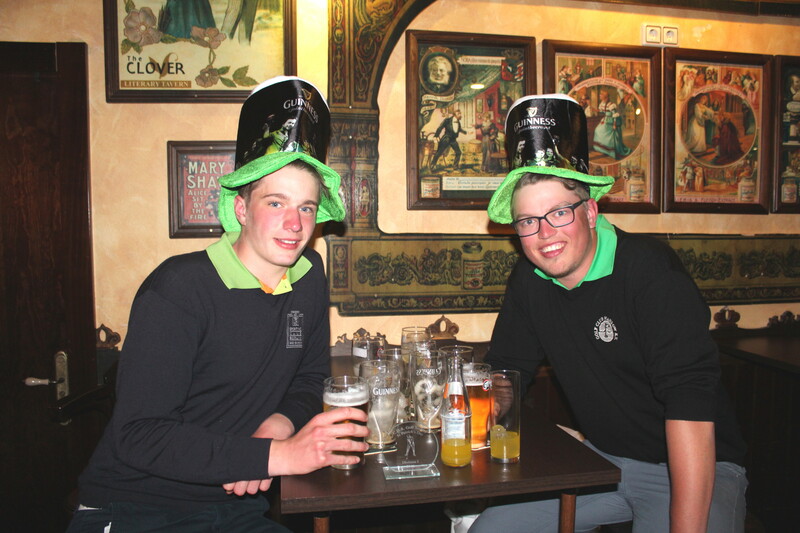 Green was the colour this week as 52 players celebrated with the Irish. The wind that got up blew the opposite way to normal, posing different questions for the golfers. Also the pin positions were place on slopes, which made putting very difficult, especially for the low handicappers who had few shots to play with. Kristen Skjold continued her run of form, taking the title with 39pts. 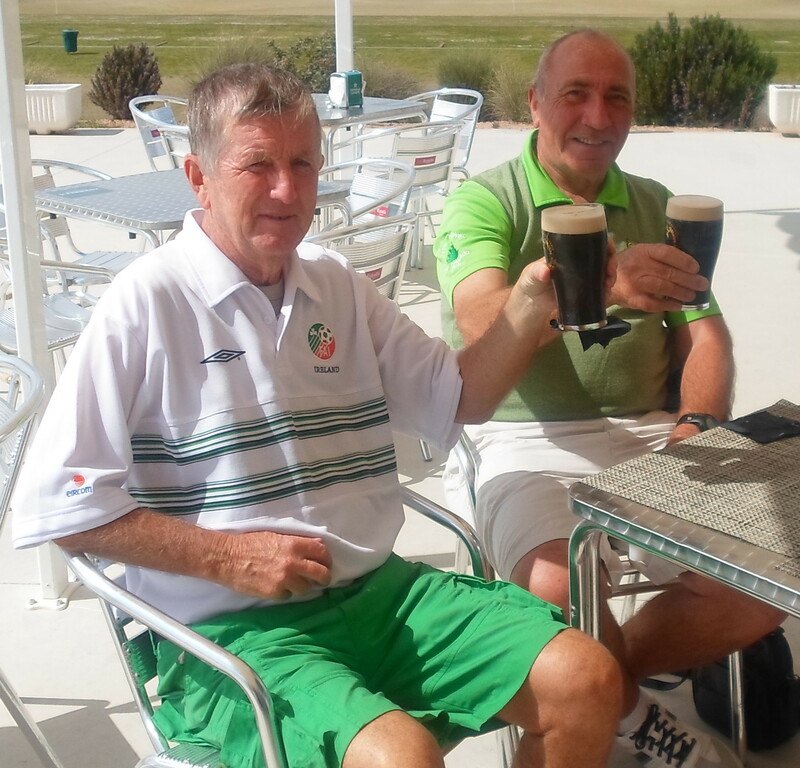 Fred and Jan share 2 of the last 5 pints of guinness in the barrel……………..
after hitting the first 2 greens in regulation, Neil’s tribulations started on the 3rd……. another one who hates Jack Nicklaus’s design?…. and finally, maybe an overswing on 18 with feet submerged?……..
here is the evidence that Phil DOES putt from 95 yds……and he put it on the green! 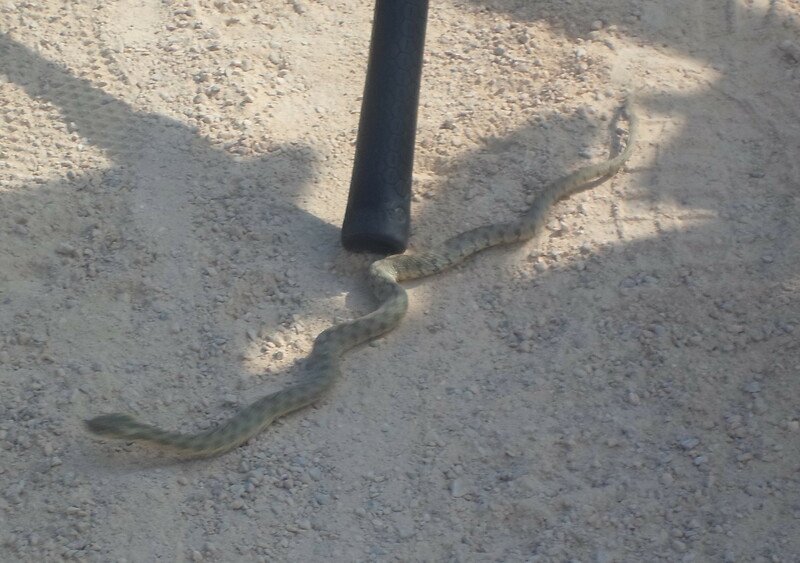 St Patrick drove all the snakes out of Ireland, and now we know where he sent them……………. Kristin won the main prize………………. division 2 winner John, but his grandson had to get in on the act……….. The nightime party was a lively affair, and everyone was treated to a free buffet (courtesy of the weekly raffle proceeds). Thanks to Lynne, Cath, Alicia and Kim. 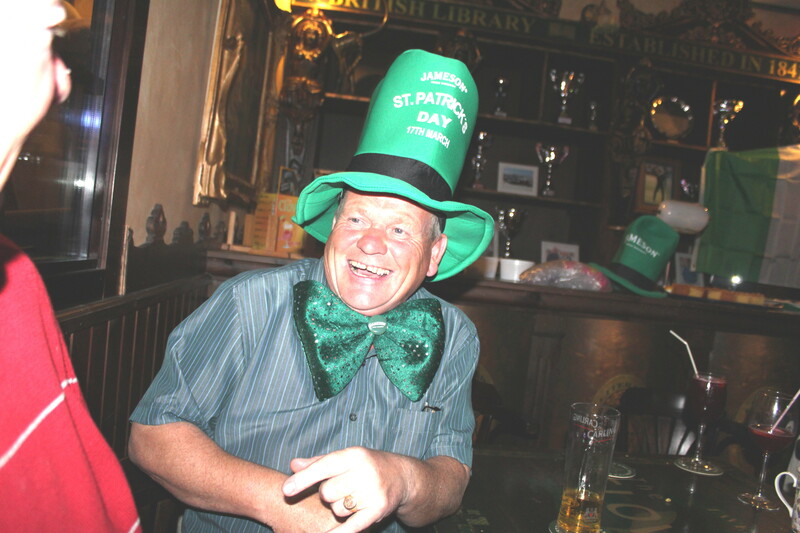 a busy night for the girls………..
Everyone got into the spirit of St Patrick’s Day……………………………when I took this picture the gentleman from Liverpool said ‘ are you from the Daily Telegraph?’. I replied, ‘no I am from the department of social security. We have had reports that you are claiming invalidity benefit for chronic back problems. We have a photograph of you dancing quite enthusiastically, so when you get off the plane at John Lennon airport our investigators will be there to meet you’. 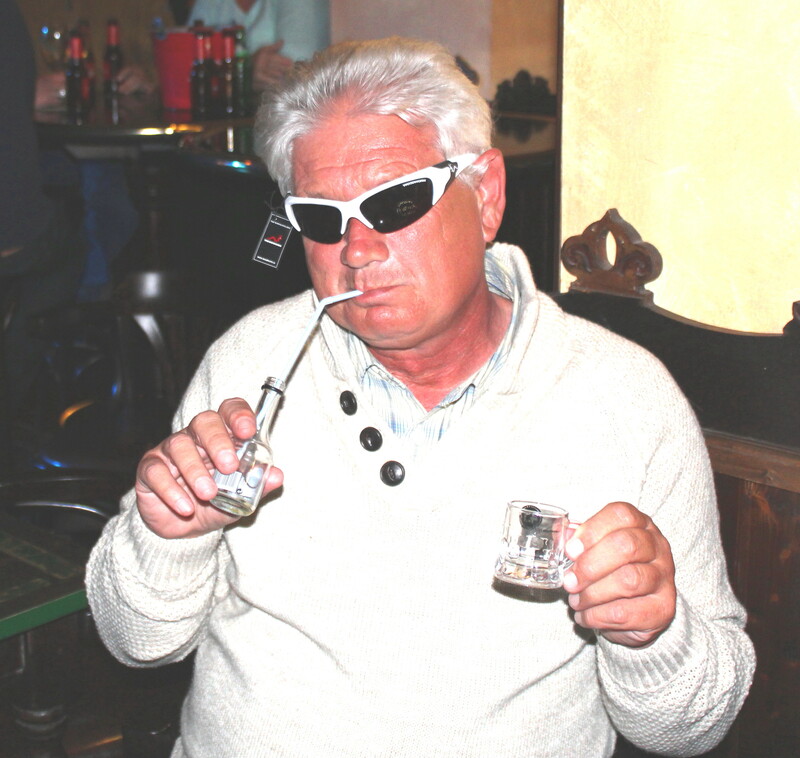 the girls you were dancing with are actually undercover agents……………..
2 young german golfers joined in……..they must have wondered what was happening……….
. Clink on the link below for more Irish humour! And it is obviously Irish jokes this week! ‘Hello, Mary, how’s your new false teeth?’ asked Bridget. ‘I’m leaving them out till I get used to them!’. Friday is a 4 person team event with 2 scores on par 3’s, 3 scores on par 4’s, and all to count on the par 5’s. John handed all the cards out, went out last, then took the money back as winner…….. The March competition for the Apollo Air trophy attracted 48 players, and started with a mist which suggested winter gear, but the skies soon cleared into a sunny, but windy day. Friday the 13th was unlucky for many, but scot John Collins was not affected, and his 41 pts was enough to see off the opposition. Dave had to pass MC to Kevin as he won division one………. Dorothy is another in-form player who just missed out………. 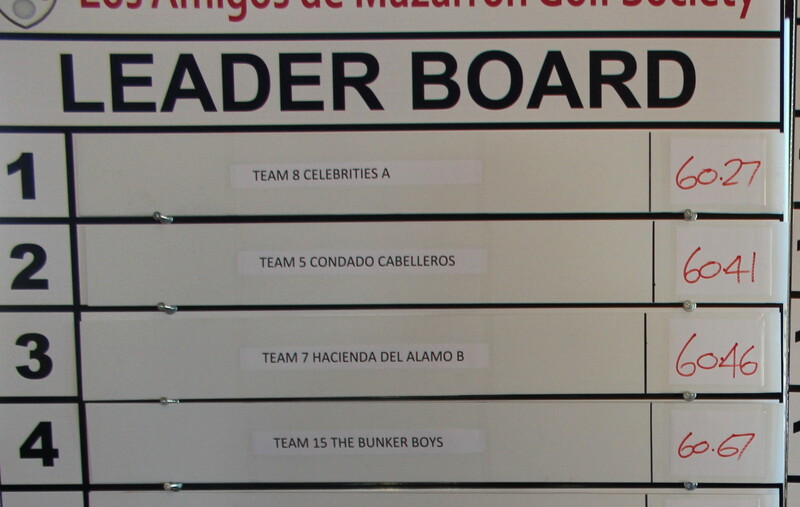 This week saw 5 teams from Condado enter the celebrity charity 4 person texas scramble at Sensol golf club, Camposol. There were 16 teams from local courses, with some teams having celebrities. Tony Currie (Sheffield Wednesday, Leeds United & England), Alan Kennedy (Liverpool & Newcastle – scored winning goal in 2 champions league finals), Peter Reeves (Charlton Athletic), John H Stracey (Welterweight boxing world champion), and David Hirst (Sheffield Wednesday & England) took part. David Hirst and his team won the competition. Our team lost by only 0.14 of a shot, but it was so close for the top 4 teams……………………. Ken Saunders, Alicia Saunders, Sue McLellan, & Geoff Hill…………….. It was sad to hear that Steven McOmish (the teaching professional from Hacienda del Alamo) is leaving Spain in the next few weeks to take up a post back in Scotland. He has helped several of our society golfers to improve their golf and get in the prizes. We wish him and his family all the best for the future. Next Friday is a 4 person team event. Coming up shortly on Good Friday April 3rd, is the Graham White pairs strokeplay event. The start sheet will go up shortly, and pairs will be drawn out at the Wednesday evening roll up meeting in the Clover prior to the Friday. 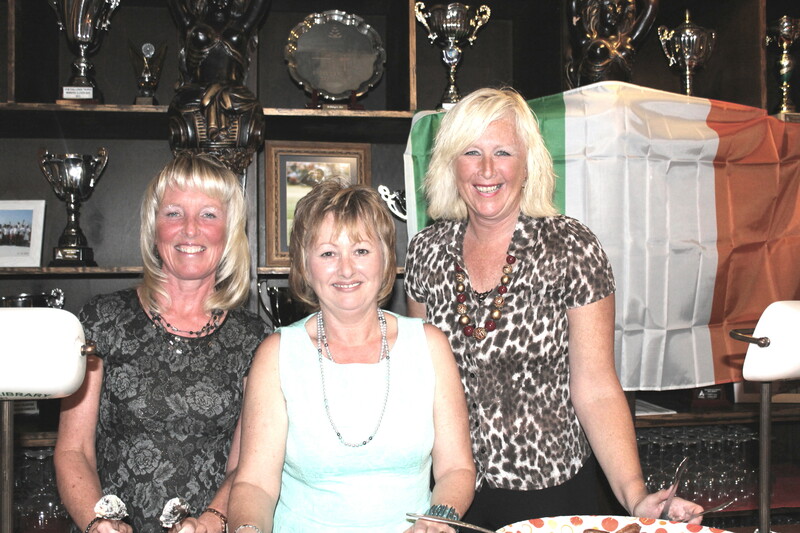 Bookings can be taken at bookings@cdagolf.com, and book your place for the evening presentation at events@cdagolf.com. It will be at Trevi’s bar in Camposol A, and Shani Ormston is our entertainment for the night. TICKETS FROM ALICIA OR KIM AT THE CLOVER ON WEDNESDAY OR FRIDAY EVENINGS. Last tickets will be sold on Wednesday 1th April at 8pm to golfers then any remaining places will be sold to others as usual. Next Tuesday is St Patrick’s day, and already there is a good entry. At night Sandy Fitzpatrick entertains us in the Clover bar. I have a deal with Jacquie Lawson cards – £13 for 2 years, unlimited cards. Here is one for our Irish friends!……..
An Englishman, a Scotsman, an Irishman and a Welshman were travelling in an aircraft that went out of control and was about to crash. To their dismay, they discovered that there were only three parachutes in the plane. The Scotsman argued that he ought to have one since he was a very important businessman whose death would result in the collapse of the stockmarket. The Welshman handed him over the first parachute and he baled out. Next the Irishman argued that he should be given a parachute. He was an important politician upon whom all hope of peace in Ireland rested. The Irishman silently put the straps over his shoulders and he jumped out after the Scotsman. The Welshman now turned to the Englishman and handed him a parachute. ‘Here you are’ he said cheerfully. ‘But what about you?’ gasped the Englishman, amazed at this unflinching heroism. ‘Oh, I’ll be all right’ said the Welshman. The Irishman took my haversack’. Our next golf competition will be again at Saurines Golf. The event will be held on Sunday the 12th of April and we will have a 9.00 shotgun start. 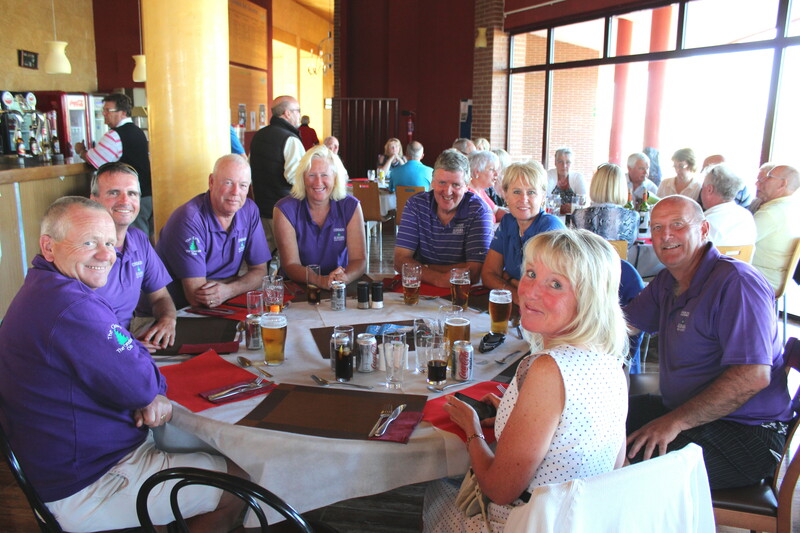 The format will be a two person team event, holes 1-9 best ball and holes 10-18 scramble, stableford scoring system. The entry fee is the same, €13 for members of IRM Nike Golf and €45 for non members. Reminder that €5 of this entry fee goes to prizes and must be paid in cash. We had a really good turnout last time and we hope to have the same for this 9 and 9 golf event. To enter pleased send me the name of you and your partner and handicaps. If you need a partner I will do my best to find one for you. On the 28th March 2015 we will celebrate the I Open Golf Tournament (in teams) “Interempresas-Interclubes” in HDA. No new volunteers, so existing committee re-elected, with roles changing slightly. It was announced that the vice captain for 2015-16 will be Neil Simpson. It was voted to remain as we are. This was passed and will take become effective from 1 April using formula already prepared. Paul Harrington had a discussion with our greenkeeper regarding pin positions for majors. He agreed that a society member could go out with him on a Thursday afternoon before a major to decide on pin position. Fred Twomey has written to IRM re condition of course and suggests other members doing the same. Dave Lloyd explained that the society had already spoken and submitted suggestions for improvements and we were awaiting feedback. Kevin Smith did explain that we had complained about colour of flags (black replacing yellow which were difficult to see) but to date nothing has been done about it. Barry Answer gave thanks to all Committee Members. visitors from outer space assessing Condado as a new home……………. A lovely start to the day with clear skies, sunshine and very little wind for the 52 players playing in a team of 4, 3 scores to count at each hole. As the round went on, the wind got up and was quite chilly for those racing around in buggies. Also after the strange pin positions of recent weeks, Paul Harrington was invited to accompany Jonathan, the head greenkeeper, to position this week’s flags. There was a noticeable difference, with pins being placed on flat sections of the greens, giving players the chance to get close with their approach putts. 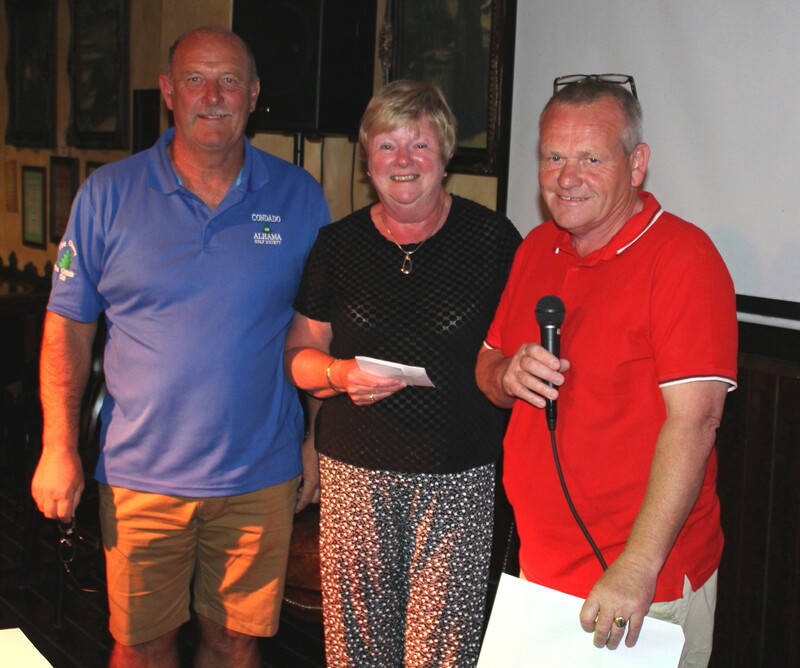 There were 4 twos – Stephen Pilley, Dorothy Simpson, Kam Cheema and Alicia Saunders, who each got a free shot from the bar and a sleeve of balls (sponsored by Dave Cooke). Phil Tann is again in the news. As he leaned on his putter at the 3rd hole to retrieve his ball, it snapped and he fell in a heap (I wish I had my camera). CPR were called, and decided that the putter could not be saved and had to be put down. An analysis of the incident was inconclusive. It could be that the many putts he had made with it from up to 100 yards had taken their toll and it expired from natural causes – or maybe it is time to start his diet again. He has now got a replacement with a stiff shaft. I also rate a comment. On hole 15 I found a difficult lie at the top of the fairway bunker. No problem for most, but being left handed meant the ball was above me, and after after 3 fresh air shots with my ball still sat there looking at me, I picked up! Partners Jostein and Barry also finished with the same score as me (zero points) even though they did hit their ball every time they swung at it! the winning team with Peter’s daughter Catherine………. It was good to see that work is being done on the bare patches around the course. 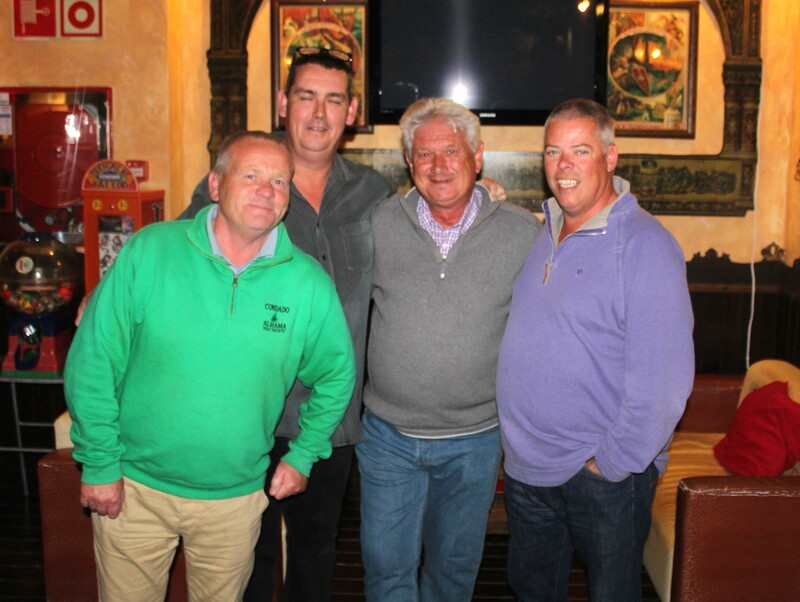 Peter Ridley found a difficult lie with his tee shot on 16………..
Pictured below is a Scottish football legend, Jocky Scott, who is a friend of our own celebrity, Peter Reeves, and played with us this week. Jocky played for Scotland, Dundee and Aberdeen. He memorably scored a hat-trick when Aberdeen beat Rangers 5–1 in a Scottish League Cup semi final. He was capped twice for the Scotland national team in 1971. He was Soccer Bowl 1977 finalist with the Seattle Sounders (lost 1–2 to the New York Cosmos) in the North American Soccer League. After his playing career Scott moved into management. He managed Aberdeen, Dundee (on three separate occasions), Arbroath, Dunfermline Athletic, Notts County, Raith Rovers and Stirling Albion. He also had coaching roles at Sunderland, Plymouth Argyle and Hibernian. The latter two he also had spells as manager on a caretaker basis. Aberdeen appointed Jocky to their coaching team in September 2012. Our own star, Peter, played for Charlton Athletic on 294 occasions, scoring 2 goals. He also captained England schoolboys. On Tuesday Camposol G.C. 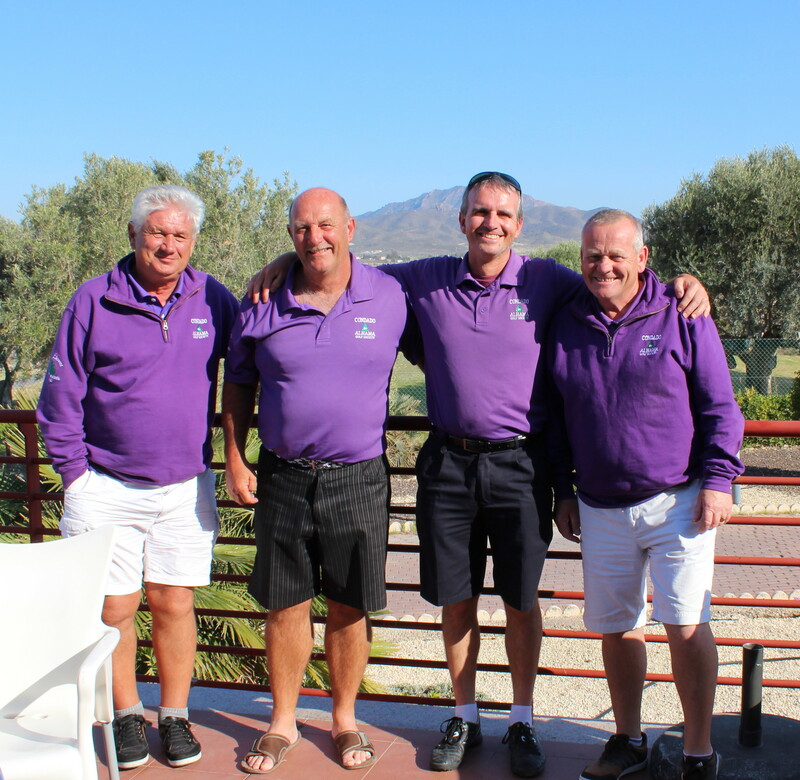 are holding a celebrity golf charity day, and our society have 5 teams in the scramble competition, It was won last year by one of our teams – Paul Harrington, Jim Alwell, Peter Reeves and Sandy Simpson . 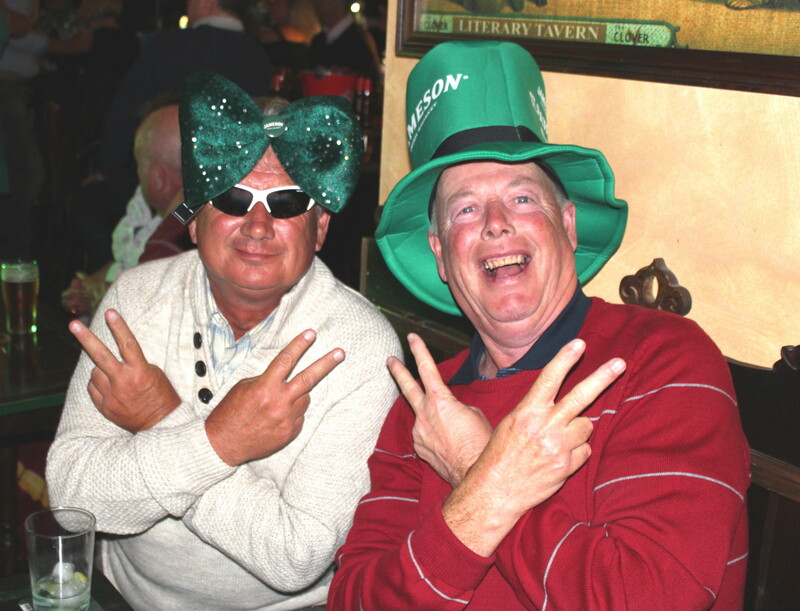 Next week is the March Apollo Air individual stableford, and Tuesday March 17th is the St. Patrick’s day stableford, which is the first special event of the year. Entertainment at night is in the Clover bar and Sandy Fitzpatrick will be on stage. A reminder that if you want as buggy you should contact the shop direct on 968328008. At the AGM on Wednesday the committee were re-elected on bloc, as no new nominations were received. There were 4 motions to be voted on. the results were as follows. The proposal for countback to be decided by the lowest handicap was defeated, we will stay as we are with countback decided on the last 9, 6, 3, 1. There is no official rule from the governing bodies but this is the most common method employed worldwide. UK & Ireland are the only countries in Europe not using the slope system. The 2 systems are not directly comparable, so a formula is used to convert UK/Irish handicaps from CONGU to EGA handicaps. After the new handicap is calculated the slope allowance is added. CONGU to EGA conversion will be for new members and those renewing with an inactive society handicap. It was voted in to use this system for any new members from those countries. Changes were voted in for membership elegibility and guest fees. There is no change to any existing members, but membership will cost 20€ for the first year, followed by 5€ a year subsequently for any renewing member (lapsed members rejoining will not pay the 20€). Membership criteria is the same a last year, non-residents are eligible for membership at the discretion of the committee. All the on-site requirements still apply (member of IRM, renter, staying with owner). Guest fees have been increased to 10€ for each game within society times. Guests will have their own prize and cannot win the society competition. Also team events which include a guest will mean that the team will have to compete in the guest section (assuming there are sufficient to give a prize). Last year the membership voted to make Mondays and Wednesdays (at Condado) non-qualifiers, and be treated as a fun day. This year that was overturned, and now they will be treated as qualifiers for handicap purposes if 8 or more players enter. Membership fees for 2015 are due on April 1st (New members – €20, Renewals -€5). The official minutes will be published when complete. At the end of procedings Barry Answer presented Dave Lloyd with a Geordie translation towel. don’t think Dave needed it – he can speak Geordie already! This week let’s look at Essex girls………………..
Q: Why should Essex girls not be given coffee breaks ? ‘How many children?’ asks the council worker. ’10’ replies the Essex girl. ‘What if you want to speak to one individually?’ says the perturbed council worker. a different view of hole 10……………..
hole number 8 looks different from this angle………..
hole 13 looks different also from above………. Summer has arrived, the house martins are here building their nests, and even I wore shorts for the first time since autumn! This week we had an excellent entry of 52 players for an individual stableford. 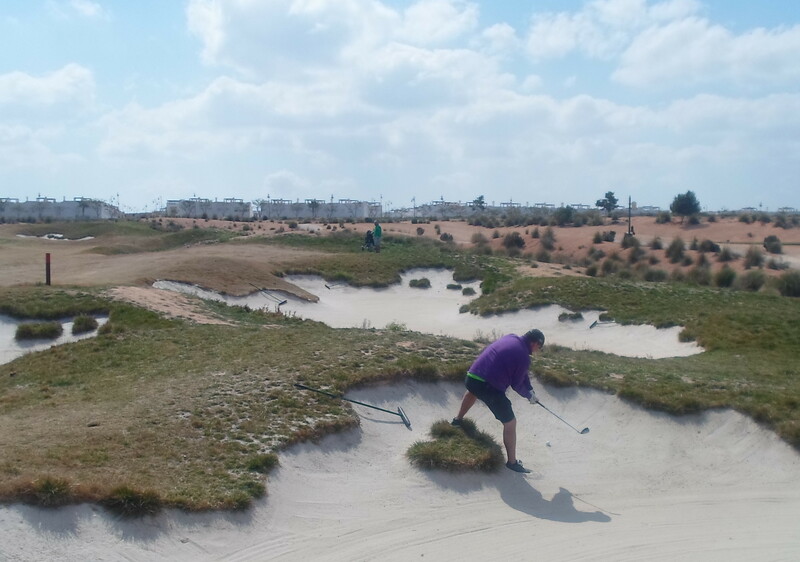 Although we did have the spring sunshine, we also had strong winds, which made shotmaking difficult and also the balls would not stay on the greens. One minute next to the hole, the next off the green and 20 yards away down a slope! I did get my revenge on hole 13 though. A couple of weeks ago I described how I had a short putt for birdie on 13 (and 5 points! ), but with a ridiculous pin position at the front corner just over the bunker, and a near miss finished off the green with a final score of zero points. This week, wind behind, I reached the greenside hollow in 2 and my approach putt finished in the same place as before, with the same pin position. This time no mistake and I got my 5 points! Only one 2 today and that was by Ellen Gulbrandsen at the 3rd hole. The scores were amazingly low – not one player played to their handicap, and only 2 were in the buffer zone – everyone else got an increase in their exact handicap. The average score was 23 points. Kevin had the day’s best score…….. 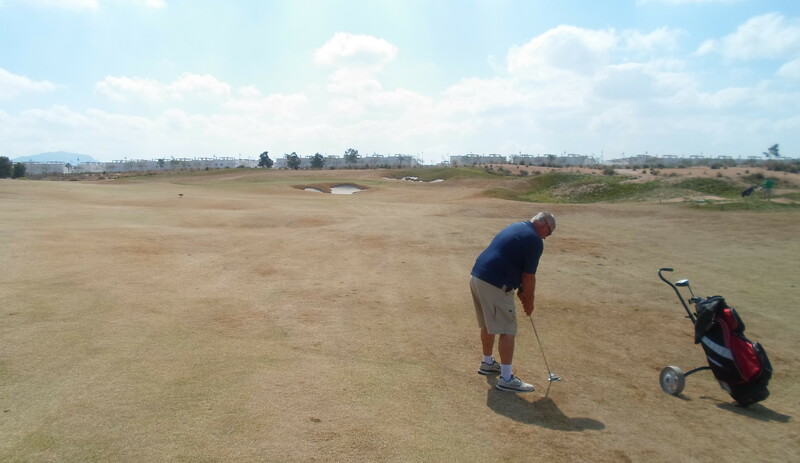 The pin positions coupled with the wind made scoring very hard……………. very hard to stop a ball on the green with this wind behind you……..
a very tricky pin position on 11 over the water………. 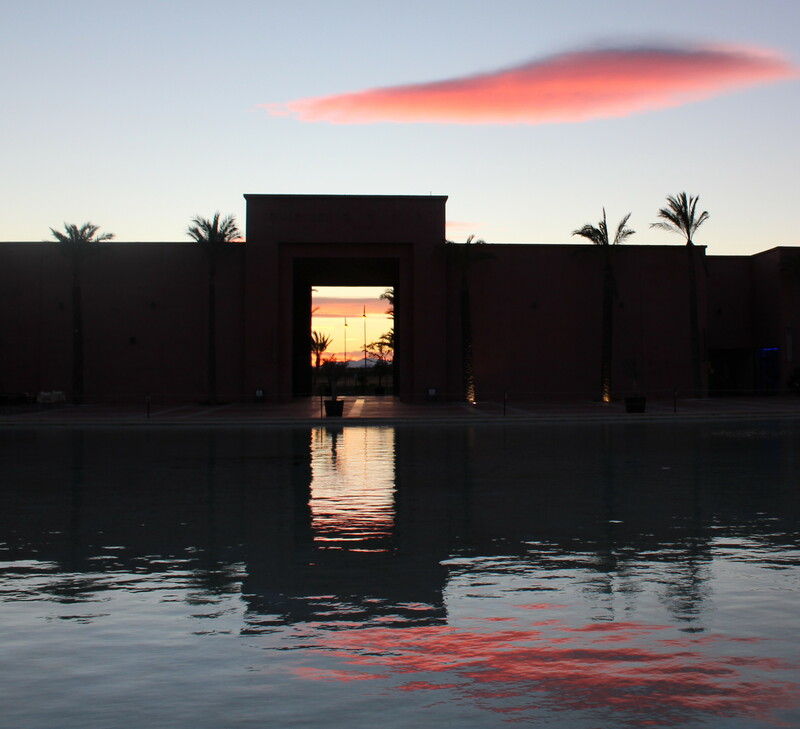 And a lovely end to a very trying day for the golfers……………..
this was the view in Al Kasar after leaving the presentation……. From next week (we will be into March) the society times will start earlier. Friday commences at 09.30 next week, then from 09.00 for the rest of the summer. The start sheet for St Patrick’s day is now in the shop (Tuesday March 17th). The AGM takes place on Wednesday at the Condado Club. Arrive at 7pm for 7.30pm start. This week it’s the turn of the welsh………………..
Two Welshmen travelling at night from Blackpool to Bridgend got into an empty compartment at the end of the train and went to sleep. Later the train stopped suddenly at a station and woke them up. “Dai, have a look out of the window and see where we are,” said Will. Dai looked out. “Oh, we’re in Cheltenham”, he said. An hour later the train stopped again, and again Will asked Dai to look out for the name of the station. Dai again said it was Cheltenham. A third time the train stopped. “Cheltenham again,” said Dai. “Come off it, there can’t be three Cheltenhams”, said Will, “let’s have a look” . . .